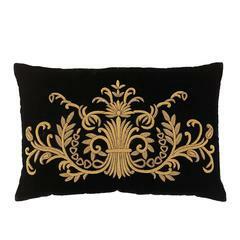 Handcrafted beaded and embroidered velvet pillow. Metallic threads Feather pad. Handcrafted embroidered beaded textile pillow. Transparent beads with various threads colors creating design. Geometric. 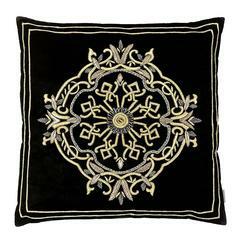 Pillow Ryad in black velvet hand embroidered with gold thread. Pillow Queen, black velvet hand, embroidered with silver thread. 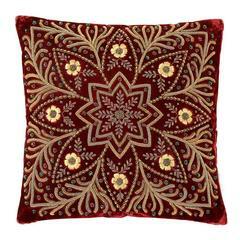 Pillow red star, red velvet hand embroidered with gold color thread and flowers.